« Op-Ed: It just wasn’t the Right One! Or Was It? 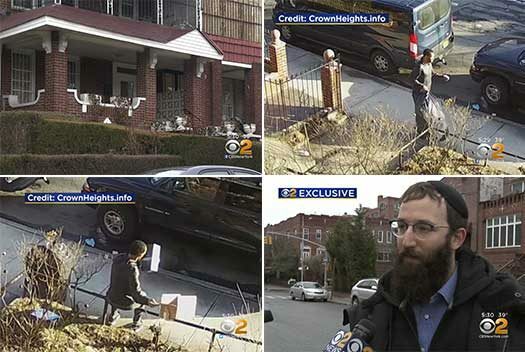 A brazen thief, who was captured on surveillance video stealing packages and opening them before deciding to take the items, caught the attention of CBS News after being posted here on CrownHeights.info. 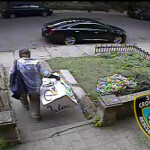 An alleged picky package thief was caught on camera in Brooklyn. Police say in one case, the man can be seen opening a package right in front of a home, checking its contents and only taking some of the items. 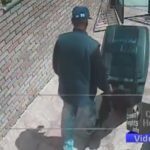 Surveillance video posted on CrownHeights.info shows the suspect casually strolling up the steps of a home near Montgomery Street and New York Avenues in the middle of afternoon last Sunday. “Sits down to the front wall of my yard, and he’s opening it up and checking out what’s inside,” victim Ben Lifshitz told CBS2’s Marc Liverman in an exclusive interview. Lifshitz said he the first sign of the alleged thief came when he returned home with his kids Sunday afternoon. Lifshitz said the suspect got away with a pair of shoes and makeup, then headed straight down Montgomery toward New York Avenue. It happened less than a block away from a police station, but he doesn’t think the man was too concerned about something like that. He never even looked up at the cameras. “Who knows what kind of guy this guy is? He could easily feel threatened and do something worse,” said Lifshitz. Which is why he wants the suspect caught. In the surveillance video, the man can be seen carrying a large garbage bag. Lifshitz thinks it was full of other people’s packages. Police said, so far, no one else in the neighborhood has filed a report. According to NYPD crime statistic, petit larceny crimes are up nearly 10 percent year-to-date in the precinct where this happened. filthbag. Find the creature and lock it up. A few people on this block have had packages stolen, problem is it takes the police department a few hours to show up, (if they ever do!) so no one reports it. Why hasn’t he been CAUGHT??? 5) This is Crow height ad we have i the city of ew york the promotion of left-wig liberalism, political correctness and a judicial system that favors the criminals. What type pf surveilance system do u have? Its a high definition QSee System from Costco. Paid around $1,400 for it and it came with 8 cameras and all the wiring to do the installation. ‘A man in a black hoody’ I think you meant to say a black man in a hoody! Does it really matter the color of his hoody…is theft common in people who wear black hoodies? Should we be cautious around people in black hoodies?? Say it as it is!